A facility that will serve as home to the Delaware Blue Coats is nearing completion in Wilmington, Del. The 140,000 sq.-ft. 76ers Fieldhouse will seat 2,500 fans of the team's G League affiliate, with the ability to host various sporting events. "This is a critical project for the area, because it's an epicenter for the entire community, and capable of bringing so many different individuals under one roof for the purpose of thriving through sports programming and entertainment," said Julia Mason, marketing and communications manager for The Buccini/Pollin Group. Mason noted that multi-use facilities embedded within a city undergoing a renaissance serve as a powerful community asset. She added that the goals for the complex were clear from the start. "Both BPG|SPORTS, the management organization of the fieldhouse, and BPGS Construction, construction management of the project, have a vision that this state-of-the-art facility will serve and help develop youth through dynamic sports programming, and provide a family-centered entertainment environment through the NBA G League Blue Coats games. "This facility is unlike any other in the region. 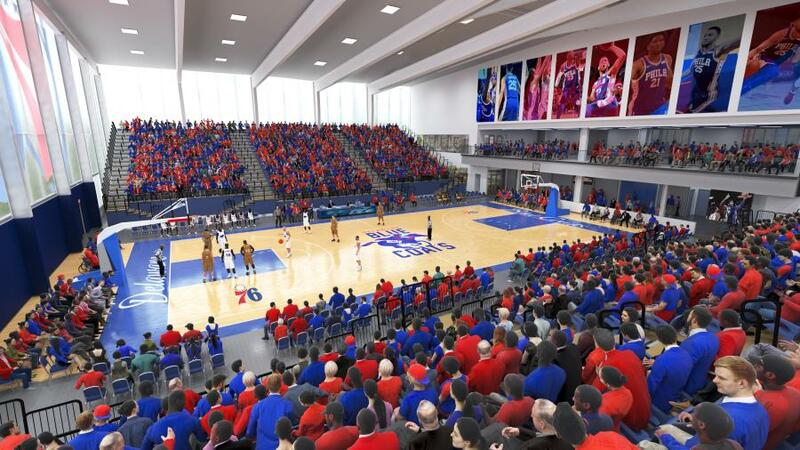 We are most excited about how dynamic this environment will be, with capabilities to have major tournaments, social events and provide a home for the Delaware Blue Coats, Nemours Physical Therapy and Titus Sports Academy." Work is expected to be finished early 2019. The team held a ceremony for the sports complex when construction began in August 2018. Representatives of The Buccini/Pollin Group and the city of Wilmington were among those in attendance. "The groundbreaking was an exciting moment for the entire city," said Mason. "Rob Buccini, co-president of The Buccini/Pollin Group, parent organization of BPG|SPORTS, explained the momentum well." "The Fieldhouse will be a catalyst for opportunity within the city of Wilmington, providing thousands of underserved youth with new sports programming. The programs offered within this state-of-the-art facility will make a lifelong impact on each child that steps foot through the doors," stated Buccini. Officials hope the complex will provide the best overall experience for all youth, adult and professional athletes at the 76ers Fieldhouse, along with offering effective programs, camps and clinics. The intent is to feature programs that focus on more than just the sport. Bryan Haldeman, BPGS project engineer, explained that the main challenge throughout construction has been coordinating the different trades, in order to maintain an aggressive schedule. "The tasks that have been completed include geopiers, concrete slabs, mezzanine deck, courts subfloor, arena painting, roofing, masonry, translucent panels, exterior graphics and hardwood subfloor," said Haldeman. "The specific work going on currently includes electrical, mechanical, sprinkler, plumbing rough in, painting, glass windows, hardwood flooring installation, lights, metal stud framing, drywall, wall panels, stair framing and the ceiling mounted basketball hoops." The project site sat for decades as an undeveloped marsh land, and was recently used as a steel laydown lot. 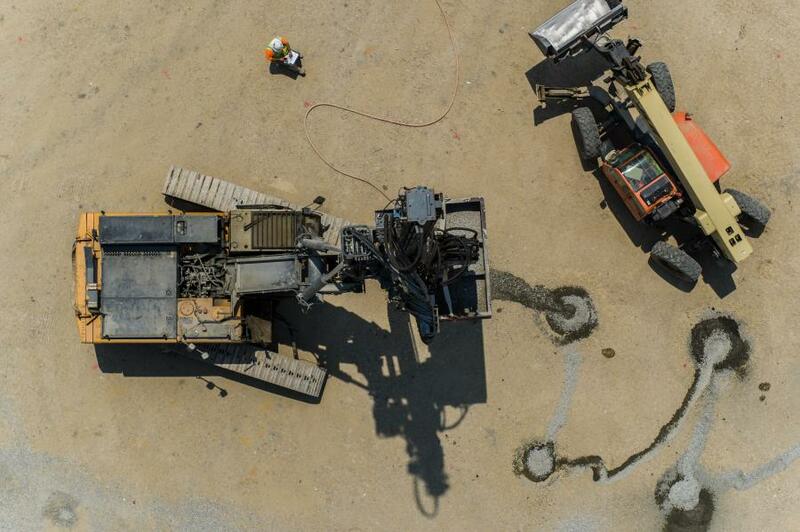 During construction, crews have had to battle extremely hot temperatures, along with other outdoor challenges. "Weather issues have consisted of rain, wind and freezing temperatures. The hardwood floor needs to be installed at a monitored temperature/humidity, so getting the arena closed-in with heat was critical." As for other concerns, said Haldeman, "The embankment/fill is critical to bring the site up to grade and achieve an elevation above the flood plain. The geographical location and proximity to sea level presents several challenges in managing on-site water." The project has required 2 a.m. concrete pours. 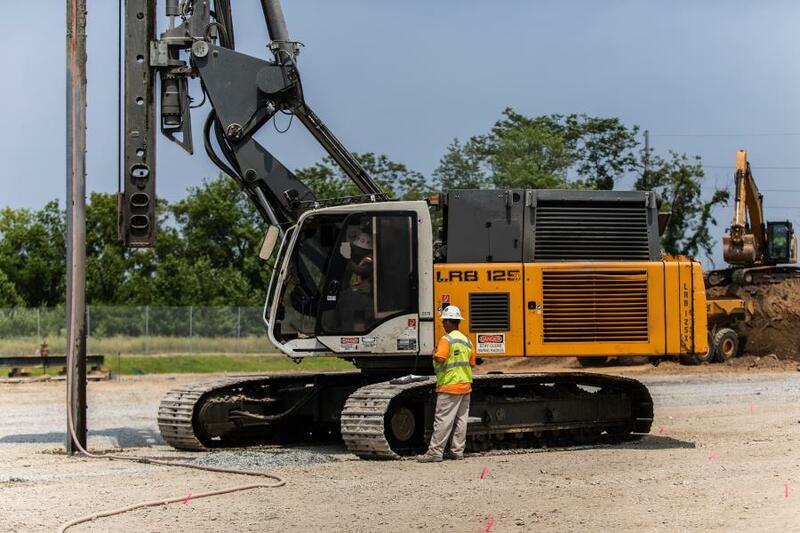 "No other trades are on site, so it provides easy access for concrete trucks. Another advantage is that the humidity is lower, so the concrete cures more efficiently." Roughly 48,000 cu. yds. of soil import will be moved on the project, along with 700 tons of steel. Main equipment being used on the job includes various pieces of large-scale earth moving equipment, assorted booms and reaches. Materials include translucent panels, metal wall panels, insulated metal roof panels, curtain wall, maple flooring, ceramic tile, polished concrete, metal studs, scored block, structural steel and concrete. GeoStructures played a key role in the early stages of construction. 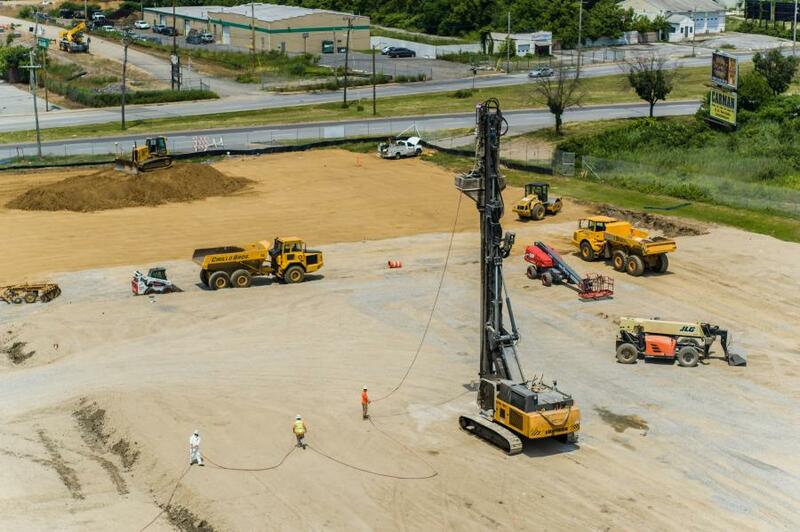 "GeoStructures provided a fast track design-build foundation solution for a site with very soft organic soils and large aerial loads due to grade raise fill," said Shana Carroll, Northeast sales manager. "The use of Geopier Rigid Inclusions provided settlement control for the new sports complex. 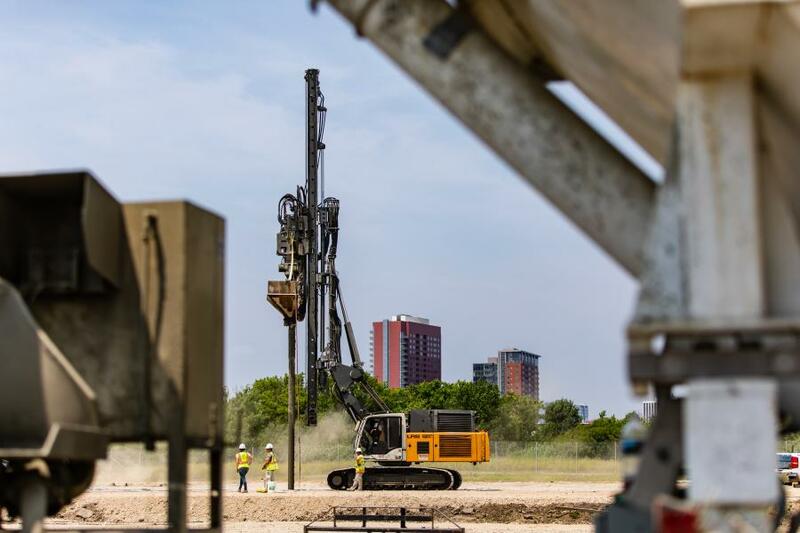 The displacement installation method allowed the in-place environmentally impacted soils to remain undisturbed, while allowing for design and construction of conventional shallow foundations with a slab on grade in lieu of piles and a structural slab." As many as 1,500 Geopier Rigid Inclusion elements, nominally 20 in. 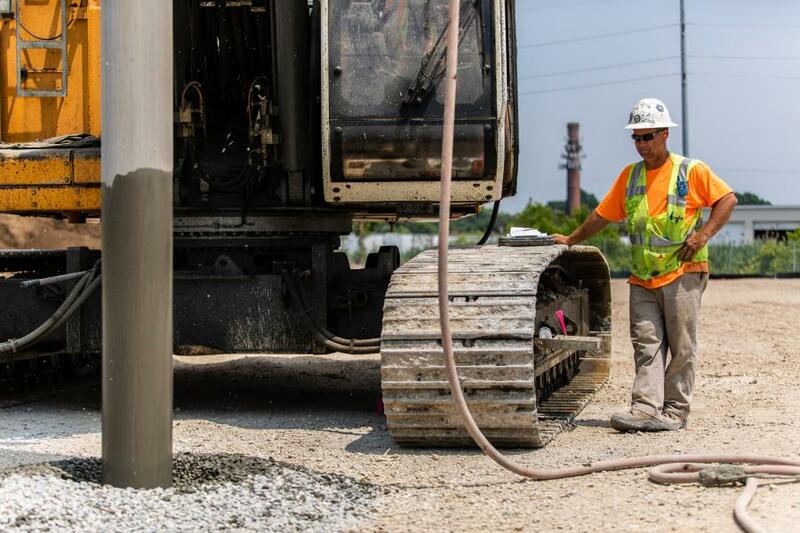 in diameter, consisting of cement grout and AASHTO #57 stone, were installed to depths of up to 35 ft. to support the grade raise fill, the new structure and resist uplift loading. They are installed by pushing a hollow mandrel charged with a cement grout /stone mix into the ground to the required pier depth. The rigid inclusion is then constructed from the bottom up, with a tremie method through the mandrel. "Depending on the soil conditions, a typical pier is constructed by raising the mandrel four feet, allowing for the stone/grout mixture to fill the hole left by the mandrel and then pushing back down two feet using the chains inside the mandrel to compact the four feet of stone into a two-foot compacted lift," said Carroll. 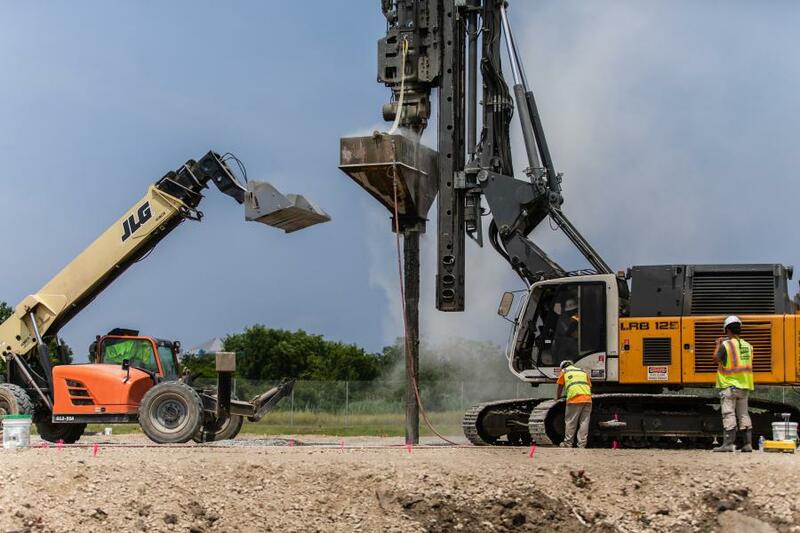 "The pile driving machine that installs the piers has approximately 30,000 pounds of crowd force to compact the stone down and out laterally. "By applying lateral stress to the soil, the pier develops additional skin friction and bond with the surrounding soil matrix, which helps to increase its capacity when compared to a conventional rigid inclusion system. The result is a rigid element that can support the load imposed by the grade raise fill and the new building loads, and provide long-term settlement control." Ground improvements were crucial to having a successful outcome on a project of this nature. "The existing fill was undocumented and variable, and the underlying very soft organic layer required a high-stiffness element to mitigate the potential for long-term creep due to organic decay," said Carroll. 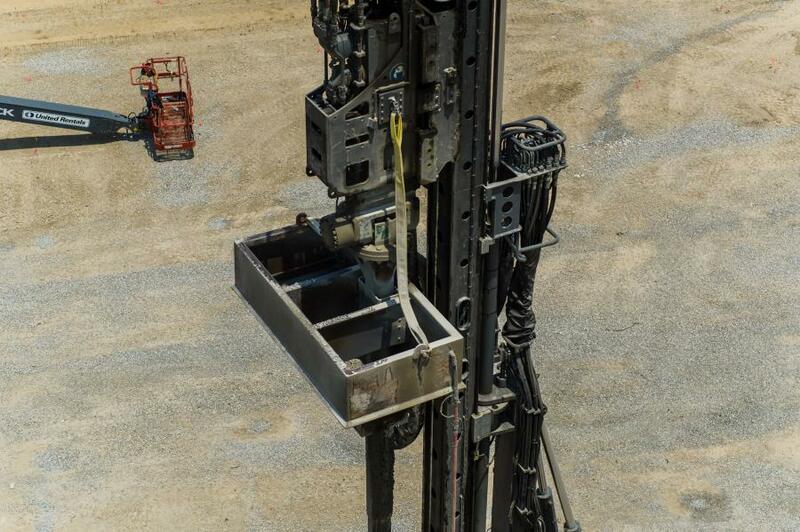 "Additionally, the site was environmentally impacted, so any foundation system employed needed to mitigate spoil generation and be composed of a low permeability material to mitigate risk for cross contamination." A Liebherr 125 XL piling rig was used for installation of the impact piers, along with a JLG G12-55A telehandler for loading stone in the hopper and material handling. In addition, a John Deere 333G skid steer was required for site maintenance and material handling, as well as a Penndrill AD1010 colloidal mixer for mixing and pumping the grout for the piers and a Penndrill PD800E cement silo for cement storage and delivery to the grout plant. According to an NBA/76ers Fieldhouse news release, Chris Heck, Philadelphia 76ers president of Business Operations, was among those in attendance when the project formally kicked off. "Today, we establish the 76ers Fieldhouse as a premier destination for great basketball development, also while providing valuable resources to this area's youth. As a resident of Delaware, it's incredible to see the growth of a community when civic leaders commit to positive change. We are so excited to follow their lead and truly engage in a meaningful and impactful way." Elton Brand, Delaware Blue Coats general manager, said, "As a former professional player, playing for the 76ers, I know what having a fieldhouse, such as this, means to the development of players. But also growing up as a kid in a single-parent home with not many options, I understand what this means to the community, to have a place where kids can go and feel safe and have opportunities. To have mentors that can coach you, that can talk to you, that you can lean on, because it helped change the trajectory of my life."